I've been working on my M53 reweld lately and I cannot find a picture or dimension of where to place the 3/8" bolt blocking pin/stud. Does it go behind directly behind the grip mounting bracket? Through it? If someone could post a dimension or picture I could use that would be very helpful! Yes but thats the WLA new made receiver tutorial. I'm doing a reweld so Its not possible to put the bolt blocking blocks in like what is shown as the grip mount is in the way. I've heard of people drilling through the grip mount and welding in a 3/8" pin for a bolt blocker, thats how pirate did his build here on the forums, problem is all the pictures are gone and I'm not sure where the hole should be drilled because there are only a few spots where it can go. The best spot looks to be towards the rear of the gun but I don't want it to interfere with the bolt buffer. Just wondering how much of a block is condsidered adequate (or legal)? Is a 3/8" stud enough? The BRP and Wiselete SA receivers have condiderably more metal as a blocker. If you follow a method whose design has been approved, you're more likely to win in court. So I have to remove the grip mount from my receiver to drill the hole? I thought you could just drill through it and weld over it once the pin is in. Note that I'm building from an original cut receiver with all grip mount still attached. Like I said I'm going off of pirate's build that is posted on this forum, there was no mention of riveting the mount back on after installing the bolt blocker, I just assumed he drilled through it but where I don't know. I'll post pictures later of my receiver and what I'm trying to do. you want the bolt blocker welded in place not riveted, not welded to a piece riveted in place. Weld the bracket to the reciever as well. Ok I see what you mean there, I was planning on having the blocker pin welded to the receiver, then welding over the hole of bracket, thus the pin is fused to the receiver and the bracket. Does anyone know where pirate drilled the hole at specifically? I would assume, since he was building his gun from cut up pieces as well, that his grip mount was already on the receiver, and he drilled through it and the receiver, heavily countersinked the hole, then welded it all up. He also mentioned how putting the blocker farther forward in the gun made it less likely to snag on the recoil spring, so I would assume he put it at the farthest forward location possible. I just don't want to mess this part up as it'll be a pain to cut everything out if it doesn't run right. 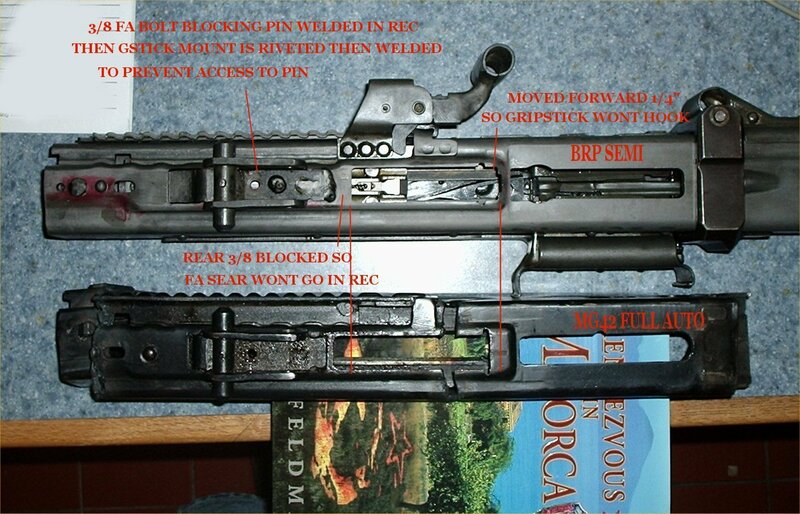 I guess what I'm looking for is a picture of someones gun who used the pin type blocker and built their gun off of cut up scrap pieces with the grip mount still riveted on. ZWcoNick wrote: So I have to remove the grip mount from my receiver to drill the hole? I thought you could just drill through it and weld over it once the pin is in. Note that I'm building from an original cut receiver with all grip mount still attached. Like I said I'm going off of pirate's build that is posted on this forum, there was no mention of riveting the mount back on after installing the bolt blocker, I just assumed he drilled through it but where I don't know. I'll post pictures later of my receiver and what I'm trying to do. Go to weaponsguild forum, Pirates build is featured there, with all the pics. update fyi -- A pdf file with the pics and complete building thread has been placed at the start of pirates old build thread.